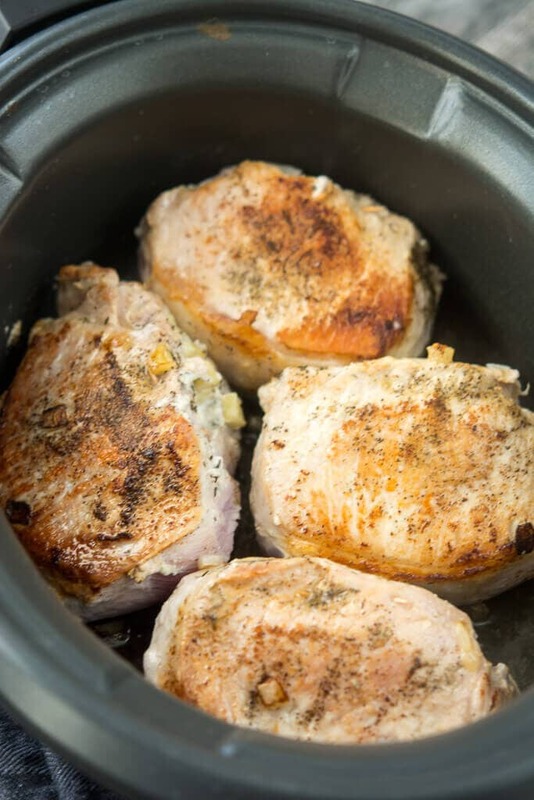 Slow Cooker Pork Chops are always a family favorite. 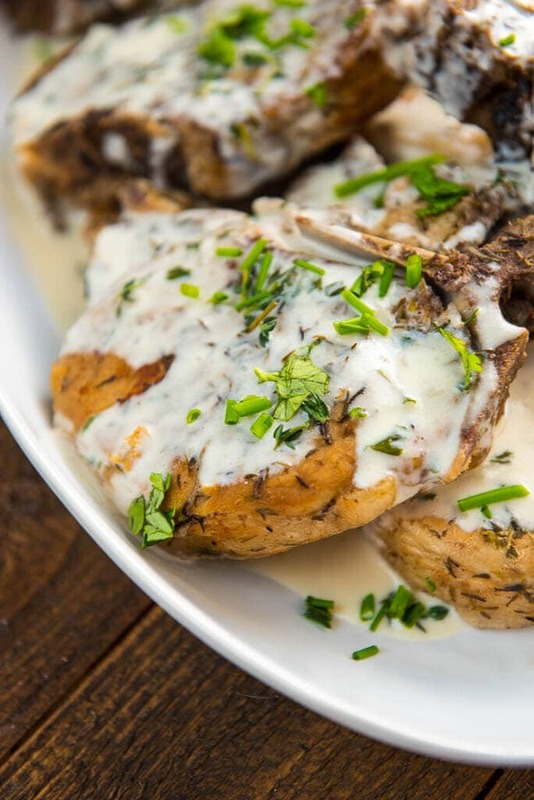 This bone in version includes a Creamy Herb Sauce that takes it over the top in flavor! I was lucky growing up in that my family all ate dinner together almost every night. I didn’t realize it at the time, but it really was a big deal. It’s something that many families struggle with now days, mine included. 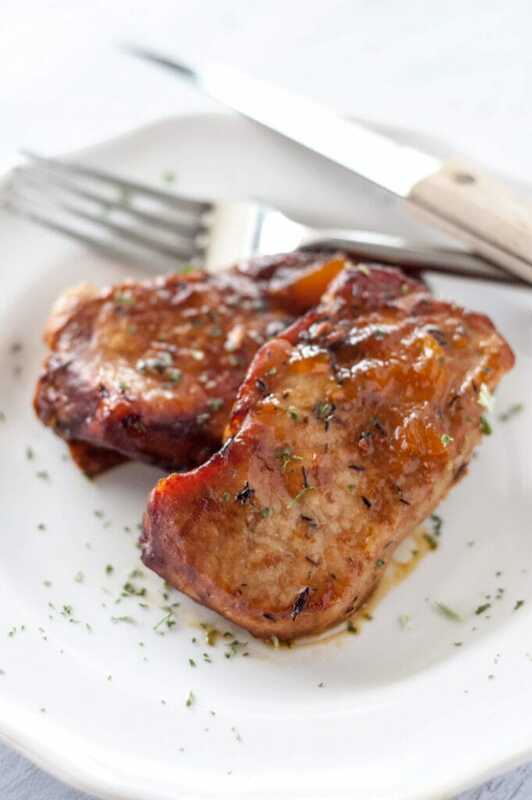 I always remember my favorite meals being my Mom’s pork chop recipes. It seems like my brother and I were always racing to see who could get seconds first and more than once I’m pretty sure it turned into a battle. I’m sure it drove my mom crazy, but at the same time she had to love the fact that we loved her cooking so much! That left no doubt that as the mom doing the cooking now, I really wanted Slow Cooker Pork Chops that I could share with my family. This recipe may be a slight departure from that original one from more than just a few years ago but in my own way I wanted to create that same sort of meal for my kids. 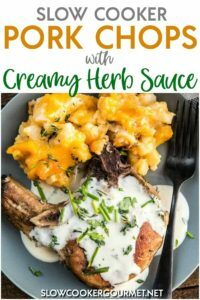 Thankfully these Slow Cooker Pork Chops with Creamy Herb Sauce seemed to do the trick. Of course it’s hard to say what kind of memories they will help make, but at least everyone requested seconds. 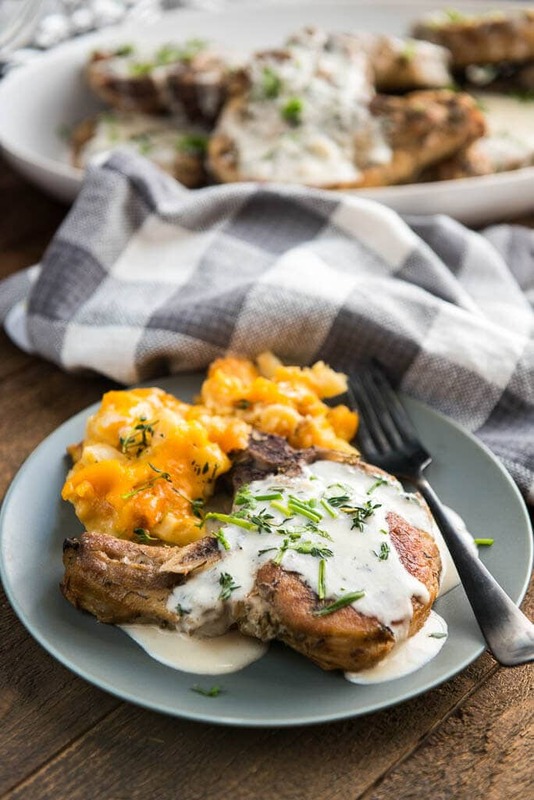 I served these pork chops with potatoes but the side dish option are endless! Here are some of the sides I recommend for this recipe. and have been using all year and love! Perfect for browning up the pork chops without using an extra pan! I use the 4 quart for most of my meals. I even turned the sauté function back on in order to make the gravy at the end. Truly a one-pot meal! 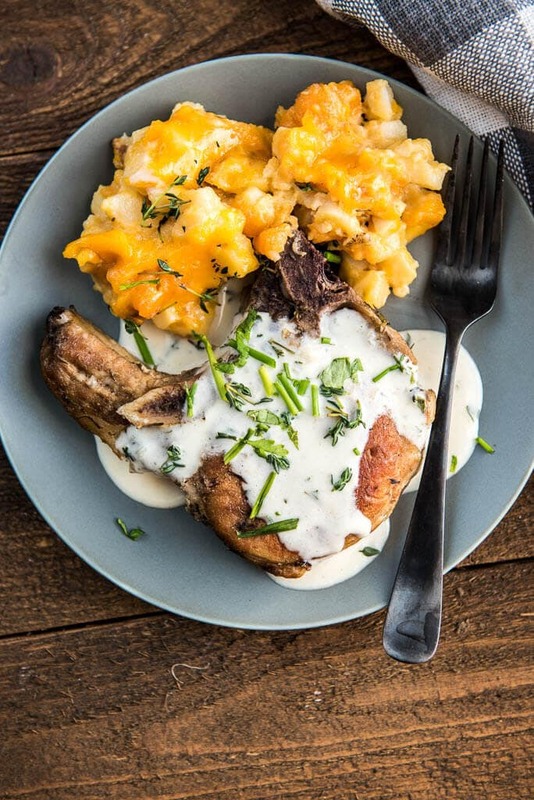 Hungry for more juicy pork chop recipes? This post was originally published on October 13, 2014 and has been updated to include fresh photos and any recipe updates due to retesting or reader feedback. I only comment on a recipe when it’s worth my time. This one makes the BEST pork chops ever. 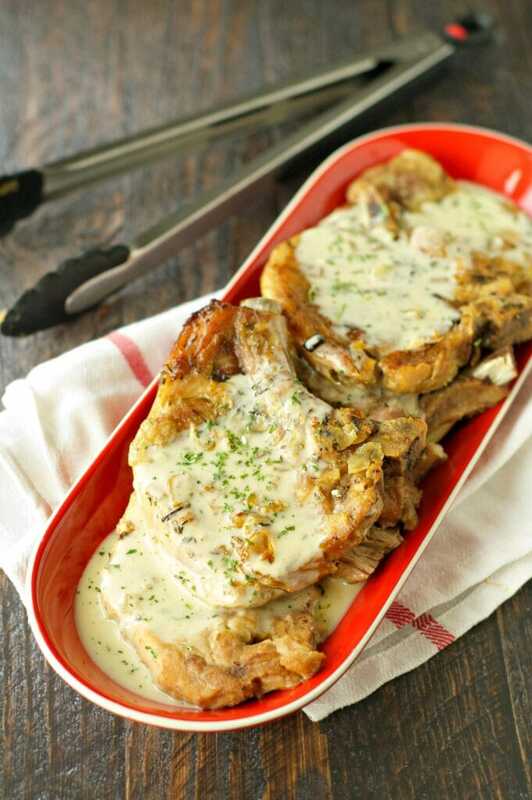 My kids have asked me to make only this recipe again when we have pork chops. I followed it almost exactly and cooked the chops on high for 3 1/2 hours. They fell off the bone as they were so tender and the flavour was out of this world amazing. 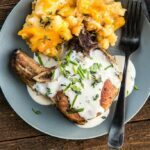 The only changes I made was decreasing the salt as I used smoked pork chops and I used plain yogurt for the heavy cream in the gravy. I want to try using wine next time!!! Thanks for the recipe as it’s one that impresses and is worth keeping! Hi Sheila! Thanks so much!!! Let me know how it turns out with wine!!! I just got finished eating these. They were very good. They were a tad dry and I cooked them on low for only 4 hours. I could not get the gravy thick enough despite 2Tb of cornstarch. I made these today and they were great. I used the bone in pork chops which are usually juicier than boneless but they were still a little dry. Any tips for this? Also, the sauce was delicious! Hi Michelle! I would probably decrease the cooking time a bit or use a smaller slow cooker. If the slow cooker wasn’t very full it could cause the chops to cook a little faster and dry out. Will try that, thank you! I felt the sauce really needed more complexity — more herbs, perhaps some wine or even some honey to balance out the salt. Thanks for the feedback! Those all sound like wonderful additions! Hi! Looking to make this tonight. Could I substitute the corn starch for flour? Also would you adjust the time for bone-in chops? Hi Jesse. Sorry I didn’t get back to you sooner, I was away for appointments all day. Hopefully you made them and they turned out great! But, to answer your questions, yes, you can sub corn starch in this recipe. 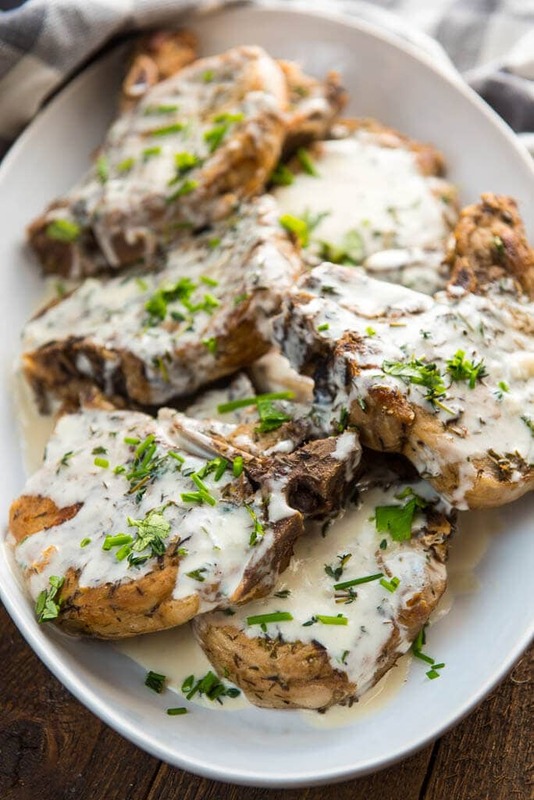 Also, the recipe is written for bone-in chops, so if you use boneless, I would probably reduce the cooking time slightly, unless they are a very thick cut chop. Followed instructions exactly using the low temp. Pork was way overcooked. Very very dry. The flavor was good, so next time I’ll cut cooking time in half. Hi Linde, Thanks for giving the recipe a try! My slow cooker cooks faster than some others, so it sounds like maybe yours does the same. Hopefully next time they will turn out better if you decrease the cooking time. Hi Liam!! This is what I love to hear. So glad you liked the recipe. Hi Olivia! I haven’t tested it out, but I’m pretty sure there’s a good chance it should work! I made this on the stove last night as it was too late to use a slow cooker and I was drooling for these flavors. Served with a quinoa and mushroom mix. Yummy!!! Sautéed onions and garlic, reserved. Slowly fried chops over medium heat, seasoned as recommended. . Removed, covered and placed in warm oven. Added broth and onion mix to skillet, increase. Heat to medium high, added cream and corn starch. Added last herbs, stirred and served.